Facebook doesn’t charge you based on how many ads you run– so should you go nuts making ads? You should run as many ads as you can feasibly manage, right? Most campaigns we see have only a couple ads, targeting giant audiences. Yes, you can go down to a single person, but that’s more a laborious stunt. 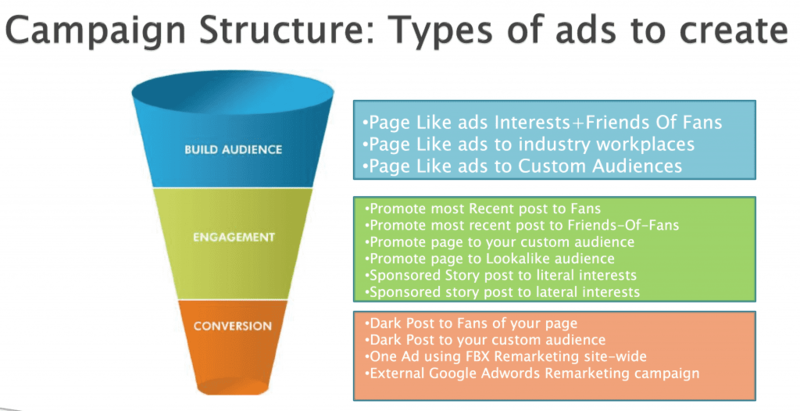 I advocate a 3 campaign structure, as it guarantees you’ve got a balanced funnel. It takes 60 minutes to set up and will largely run by itself to produce results over time. More specifically, here are the ads you should be running within these campaigns. Now you’ve got the major types of ads to drive fan growth, tie in your email power, drive remarketing back to Facebook, and stimulate leads on your site. When you tie everything together, you get a compounding effect. For example, when you drive a page post link ad to your site (perhaps with the new “call to action” buttons), you can have a remarketing pixel pick them up on your site. Then they’re automatically in a retargeting flow. The fact that email and website custom audiences can be filtered by connection targeting (if they’re a fan or not), if they’re not a customer (exclusion audience), mobile vs non-mobile, or any precise/partner target, means you get infinite combos possible. So why wouldn’t you run different combos, as many as you can test, to unlock what drives the greatest ROI at different points in your sales cycle? Our buddy, Jon Loomer, has a great post about combos you can run here. How many ads are you running and how do you structure your campaigns? « Your big email list isn’t monetizing? Heather Dopson explains why.